Twenty years ago, we moved into our “starter” home. It was a small house but it was in a quiet neighborhood of a growing community and it had two very important things: an attached garage and a fenced-in yard. It didn’t take long before we realized the most important thing about our new home was great neighbors. We were surrounded by awesome, friendly people of all ages. This was the neighborhood where May baskets weren’t just exchanged, you actually waited for the doorbell to ring so you could chase after the deliverer. On Halloween, you didn’t just say “trick-or-treat”, you were expected to have joke to tell. In the spring, everyone marvelled at how much the kids had grown over the course of a long winter. Run out of sugar? Send your kids next door and they would come home with the exact amount you need. Our driveway was the meeting place for watching the fireworks on the 4th of July. Our house looked directly down a two-block street and just over the trees at the end of that street was the park where the fireworks were detonated. The kids had their sparklers and snaps, the adults had their popcorn and beer, and everyone had a blanket or chair. Not only were we blessed to have settled in such a friendly area, we settled next door to a family who had just moved in a few months before us. Their kids were about the same ages as our boys. They were ISU alum just as we were. They were Catholic, we were Lutheran (close enough). We quickly became the “go-to” friends for each other. You know you trust someone when they know the combination to your garage door as well as they know their own. Did you ask Kurt & Mary if they will get our mail while we are gone? Mary, my washer just died … can I use yours? Can we borrow your patio set for the party? Would Brie or Dani be willing to take care of our dog this weekend? Feel free to kick Marcus out of your house whenever you want. Could you run over to our house, let yourself in, and make sure Cole is out of bed? He’s not answering his phone. Over the years, the only battles we ever had involved the trees on our property. We have big maple trees … the kind that produce ridiculous amounts of helicopter seeds in the spring and leaves in the fall. Seeds and leaves that, with a good south wind, inevitably end up in Kurt & Mary’s yard. Not sure how many times Kurt threatened to rake them up and dump them back in ours. It is always good to know your neighbors’ weaknesses so you can make up for those unfortunate (and, I might add, uncontrollable) incidences. Kurt & Mary’s weakness? Rhubarb. Twenty years later, we are still in our “starter” home. Kurt and Mary are still our neighbors … for a few more days. They are moving into a new home and we will miss them. I think it’s only appropriate that they are moving just as my rhubarb is ready to pick. 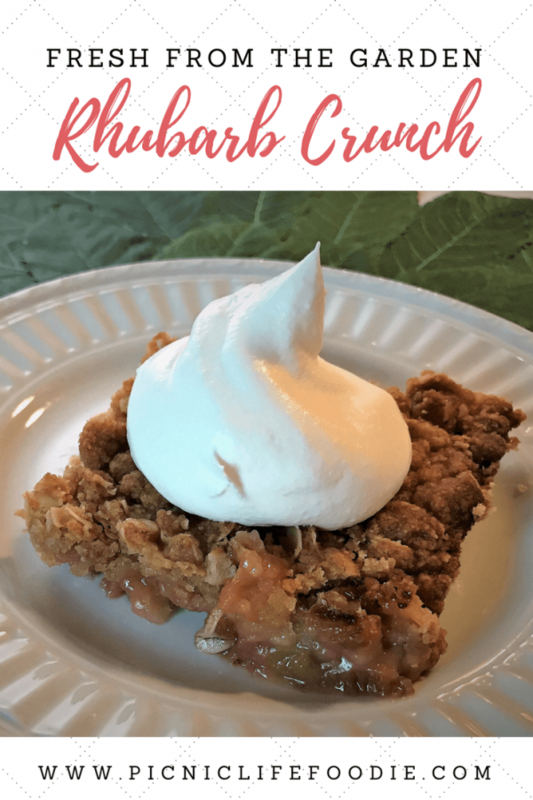 Tart rhubarb is perfectly balanced by a crunchy, sweet oatmeal and brown sugar topping in this simple recipe. 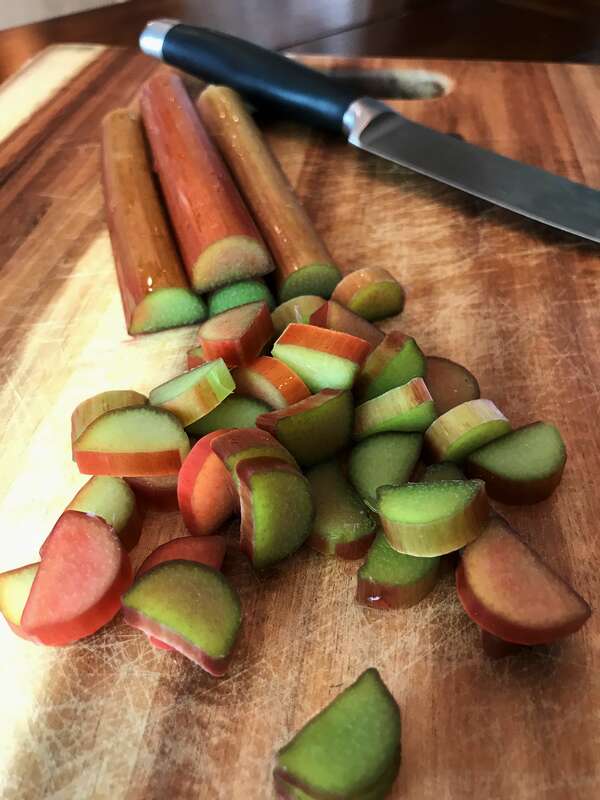 This fresh-from-the-garden (or farmers market) dessert is sure to please everyone ... even those who think they don't like rhubarb! 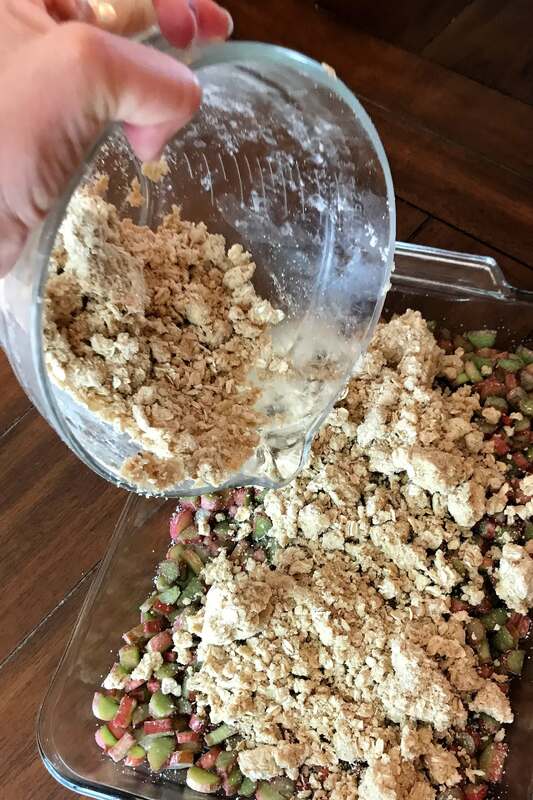 In a large bowl, combine 1 cup of sugar with 3 tablespoons of flour and pour over sliced rhubarb; toss to coat and evenly distribute. 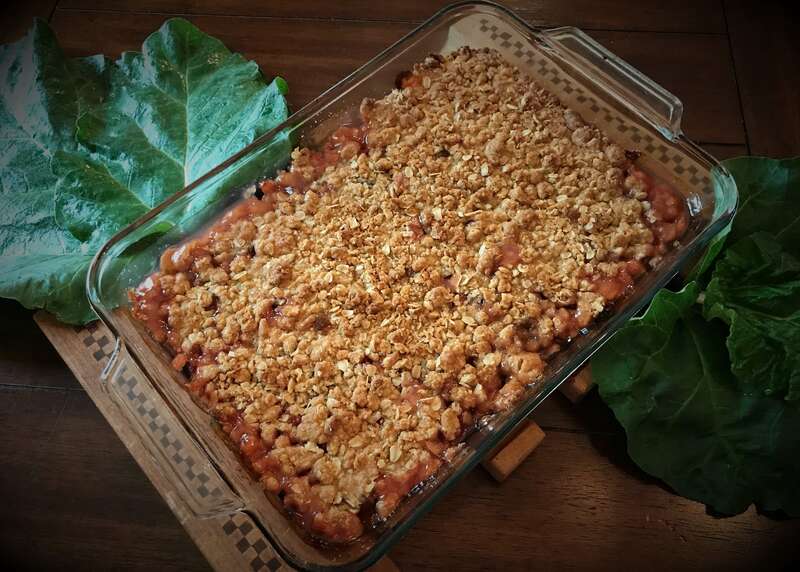 Pour into a 9"x13" baking dish that has been lightly coated with cooking spray. In the same bowl, combine brown sugar, oats and 1 1/2 cups flour. Using hands or forks or a pastry blender, cut butter and margarine into oat mixture until small clumps remain. 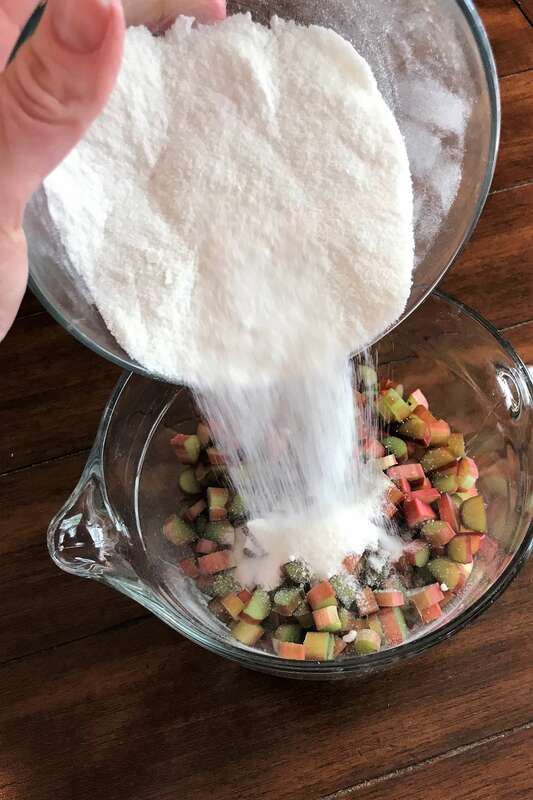 Sprinkle evenly over rhubarb mixture. Bake for 40 minutes or until browned and bubbly. 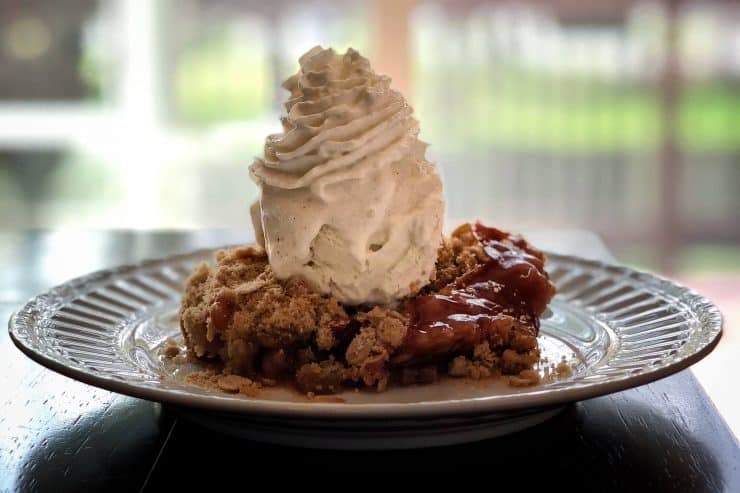 Serve warm with ice cream or whipped cream ... or BOTH! This will make the perfect house-warming gift. May God bless them in their new home and with neighbors who value them as much as we do. And technically, they aren’t moving that far away that I couldn’t take them some next year. 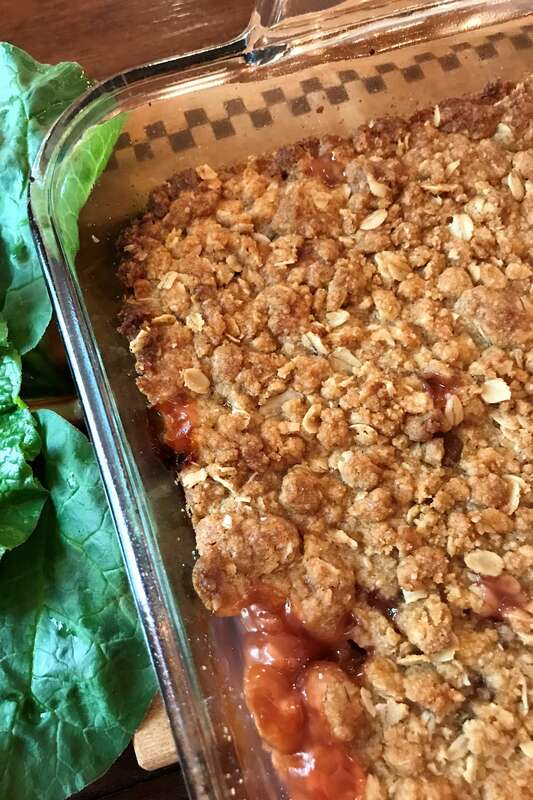 Rhubarb crunch in the spring and a bag of leaves in the fall. 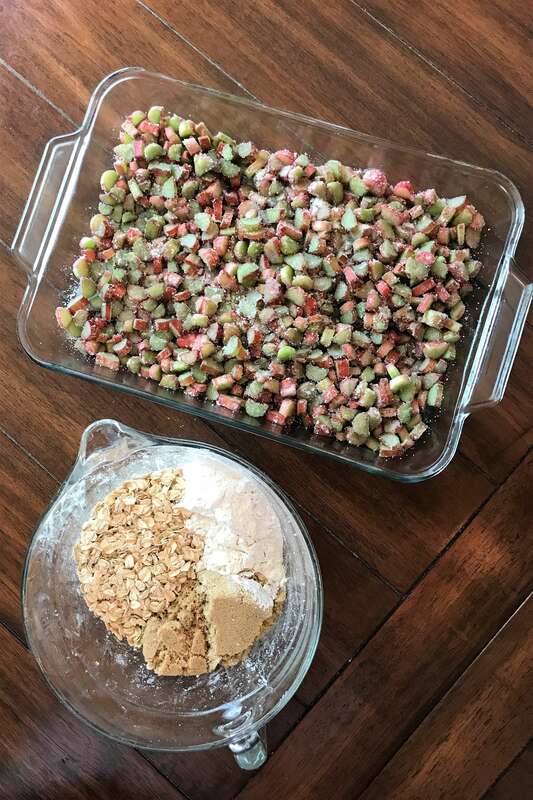 Rhubarb and oatmeal combine to make the perfect springtime dessert. Leftovers make a sweet breakfast treat too! Anita, so good to meet you last Friday at the Wallace House dinner! 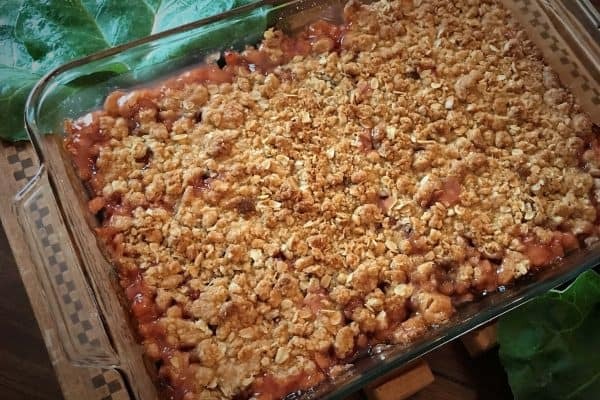 the rhubarb is ready and I am making Kurt and Mary’s Rhubarb Crunch this weekend! Sounds so good. Thank you for sharing! Great blog! I will be back! That is wonderful! We enjoyed your company too! Let me know how it turns out for you!